One of my favorite things about comic books is the way they glorify my chosen profession. Many superheroes pick up a camera or notebook after they put away their capes, taking to the fictional streets of America as journalists. Superheroes and journalism really go hand-in-hand, and it’s no accident. In fact, it’s all about realism. A news reporter or photographer is the perfect secret identity for someone is always making news. If Clark Kent showed up every time Superman made an appearance, and din’t carry a press pass, people would get suspicious. As a reporter for the Daily Planet, Kent is expected to follow Superman around, so no one would ever suspect that he and the Man of Steel are the same person. The same goes for Peter Parker of the Daily Bugle. Of course he’s always around when Spider-Man swings into action! How else would he get those amazing photos? Journalism also provides heroes with the resources they need to fight crime. Working for newspapers gives Clark Kent and Peter Parker access to information; they learn about crises first, so they can respond quickly. The Internet has made that less true (the “Miracle on the Hudson” was first reported via Twitter), but working for a major news organization is still important. Would Spider-Man be as effective if he had to read thousands of tweets by himself before getting some actionable intelligence? One superhero, the Question, goes so far as to make journalism part of his modus operandi. As T.V. news reporter Vic Sage, he investigates criminal acts, exposing the corruption of Hub City in nightly broadcasts. 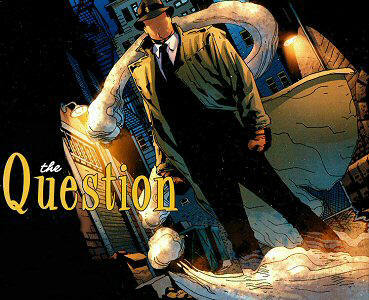 Then, he takes to the streets as the faceless, trenchcoat-and-fedora-wearing Question to dispense justice. Superhero journalists aren’t just reporters, either. The Green Hornet owns a newspaper, the Daily Sentinel and, like the question, uses journalism as a tool in his war on crime. Britt Reid publishes stories depicting his masked alter ego as a powerful mobster, spooking his enemies while concealing his true identity and intentions. Journalism’s role as the “fourth estate” is wholeheartedly embraced by the creators of superheroes. The heroes are, after all, supposed to be real people with extraordinary abilities. They need day jobs that won’t conflict with their crime-fighting missions and, maybe, on a good day, Clark Kent’s reporting can do as much good as Superman’s crime-fighting. This entry was posted on March 7, 2012, 10:25 pm and is filed under Media, Nerd Stuff. You can follow any responses to this entry through RSS 2.0. You can leave a response, or trackback from your own site.